Pictured above, Sisters Thao Pham (left) and Tuyet Pham (right) from the Dominican Congregation of Bui Chu in Vietnam. Among the Christmas gifts arriving at Mount Loretto were two guests who will live among the Dubuque Presentation Sisters for the next couple years. 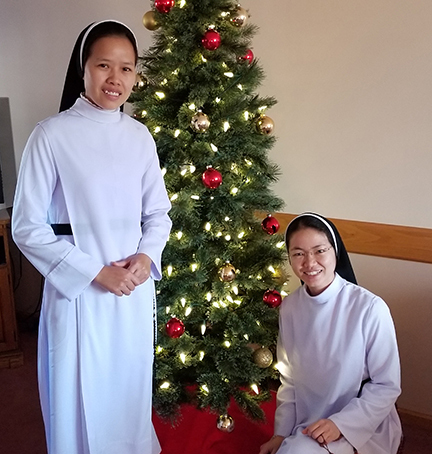 Sisters Thao Pham and Tuyet Pham are from the Dominican Congregation of Bui Chu in Vietnam and are being sponsored by the Sinsinawa Dominican Sisters. They will live with the Dubuque community while they study English as a Second Language (2 years) and later live at Divine Word College during their studies for a bachelor’s degree (4 years) at Divine Word College. To help them learn English they will participate in the ordinary routines of religious life (prayer, meals, daily mass, activities such as arts, crafts, piano, etc.). We are looking forward to getting to know them!